Apart from the above, for me, it is an opportunity to socialize and make friends. I have made many good friends through this network. 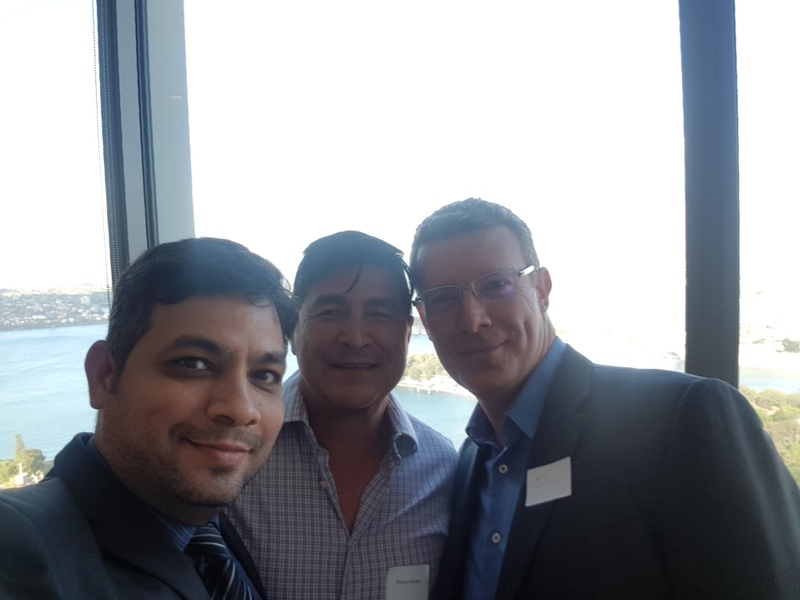 You can see the friendship through the photo below which I have taken with Steve Howe, and Benjamin Howell, who are the Marketing Director and the President of PMI Sydney Chapter respectively. There is a great deal to learn when you are interacting with a collective wisdom of about five decades put together. This article is more to do with the event that I attended today. It was conducted by the Managing Director of asq projects, Mr. Steven Pulman. The company is a consulting firm operating from Singapore and Sydney, since 2001 and helping organizations with change, transformation and project management areas. The session started with a stark difference between Change and Transformation and the table below describes, the parameters associated with both the streams. The notion and the argument presented by Steve was the conceptual difference between change and transformation. From the table, it could be seen that transformation as a concept is more long-term, or even ongoing, while change is short-term and time specific. Transformation is something that is organization-wide, while change has a discrete structure and may be applicable to only a particular department or a project within. You can easily see the differences between the two from the table. Let us consider the examples here. Nokia and Apple. Nokia focussed on having cheaper phones with longer batteries while Apple focused on the human element of owning a phone. What Nokia was trying to do, is change and what Apple did was the transformation of the product, in fact, of the industry itself. Another example of an organization not been able to transform is Kodak. They were amazing in films and creating pictures, large pictures from their films, etc., but the disruption called digital came and changed the fate of an amazing company. Just failed to transform. You have to realize that, again, as I keep on referring to the aspect of mindset in my articles, the concept of transformation is all about the mindset and ensuring an organization-wide effort to continuously evolve. One embarks on a transformation journey when faced with dire consequences and once the journey begins, it is a continuous one. Many organizations or departments of large organizations are implementing transformation programs nowadays but the question to ask is, are they truly transformational in nature. Are they going to change the way the company interacts with customers and employees and able to generate consistent returns for the stakeholders? A very good example that I could think of a company which is on a continuous transformation journey is Amazon. The way it hires, it’s work culture, interaction with customers and the value it adds to shareholders year on year is a testament to a true transformational company. I believe and to that effect, even Steve mentioned that a transformation consists of projects, programs, and portfolios, which work towards achieving incremental change in order to steer the organization in a particular direction. I think change is a subset of transformation. It is the incremental change that leads to transformation. There were some interesting questions raised around the justification of investments associated with transformation, especially when there is uncertainty associated with it and again coming to the point of businesses using this as a buzzword. My key take away from the session was that transformation is perpetual, ongoing and continuous, while change is time-bounded, benefit-oriented and can incrementally assist in achieving the transformation sought by the organization. Lastly, I encourage you to consider joining industry organizations, like PMI and if possible even volunteer to learn new things and grow in your profession. I hope, the article presented some ideas around the concept of change and transformation and I will be keen to know more about your projects and what approach are you taking within your organization in the context of these principles. Excellent Gaurav. Yet another great article and information from you. You are such an inspiration to lots of people. Thanks for your contribution. Hi Dharmesh, I am not sure if you were present last night at my presentation, but if you want to know more about the Distinctions between Transformation and Change or our work at Asq Projects please feel free to contact me. Thanks Gaurav for your summary and insights into the presentation I did last night. The distinction for transformation is not just about mind set, it is about leadership with Vision and commitment as the business transforms. What drives transformation is always an inflection point such as a burning platform or a burning ambition and is always going to drive different behaviors than a stable and operational company exhibits usually. Just some more ideas and thoughts to provoke discussion and thinking. if anyone has any questions that would like to ask of me or my team please feel free to contact me. Thank you Steve for an amazing session once again. I totally agree that the leadership involvement is a must when it comes to transformation. I am seeing those differences all around me and can totally relate to the thought process now. Interesting discussion gentlemen. I find myself in a space where I ask myself, and my clients, regularly ‘is this change or is it transformation’? The intention to transform is often spoken but the actions limit the possibilities. Today I referred back to the Greiner Curve to remind myself what are the key triggers for change in an organisation. Trying to make sense of what is change vs transformation is something I spend a lot of time thinking about. Leadership with vision and commitment is essential, but how do you test this out before you take an organisation on a hero’s journey? How can you be sure that the leadership will stay committed for the journey and knows what they are committing to in advance of starting work. The work we do, you know is going to create pain and discomfort and therefore can be retreated from at any stage? How do we as experts help clients to stay the course.